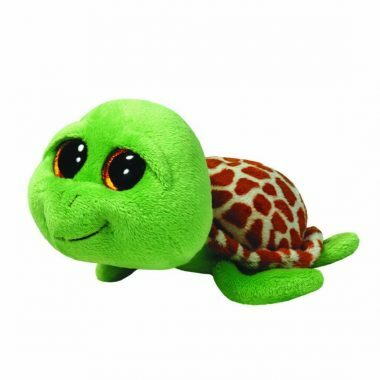 Zippy is made from a fuzzy, bright green material and a yellow shell covered in brown patches. He has large, sparkly gold and black eyes, which are half closed, and black stitching for his nostrils and mouth. Zippy the Turtle was introduced on 1st July 2013. This is the regular 6″ version of Zippy. He was also released as a 9″ Beanie Boo Buddy, in a large 16″ size, in an even larger 32″ size and as a key clip.